Bike Rack for Trailer Hitch: 1 1/4"
Bike Rack for Trailer Hitch: 2"
The Top End Force 3 Handcycle from IndeMedical.com features a wrap-around frame design, an upgraded cable driven parking brake and upper chain ring derailleur plus disk brakes all at a great price! This is the perfect hand cycle if you’re looking to just get started in hand cycling or are ready to “force the pace” at your next competition! 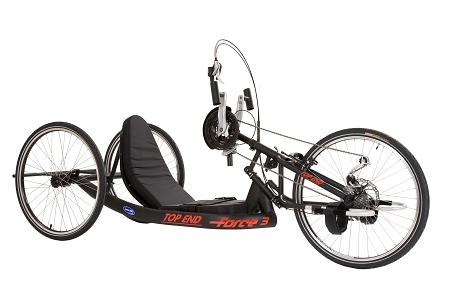 It will replace the popular Top End Force-2 and has been totally redesigned to Get you Out Going! What will you love about the redesign? First the wrap-around frame is sleek and stiff with more ground clearance and a higher transfer seat height. The reclining back rest is standard but if you want a straight back (trunk powered position) it is available as an option. The 26-559 wheel size offers many tire choices from high-performance road tires to cruiser tires or even knobby tires! The front disk brake delivers super controlled braking power and the cable driven parking brake is operated using just one hand. 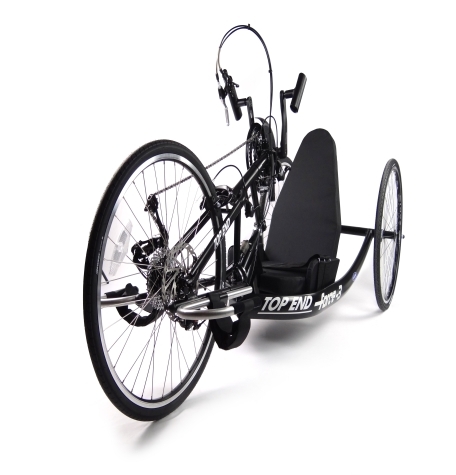 It has 27 speeds, high-performance wheels, Shimano components and is totally adjustable. Plus it comes with a safety flag, chain guard, seat and back cushions, drafting bumper and a disk brake. There are two backrests available too! The reclining backrest is standard but an optional straight back style for those who prefer the trunk power position is an option. 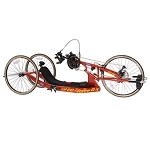 Plus the straight back is compatible with the BionX® Power Boost that adds 25, 50, 75 or 100% assist which is perfect for steep inclines and strong headwinds. 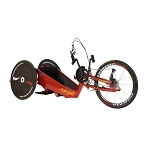 This is the perfect hand cycle if you are just looking to get started in handcycling or want begin competing. It is painted in a contemporary flat black color, appropriately named “Stealth Black” and available in either 15" or 17"seat widths. Tire Selection: 559 wheels compatible with either cruiser or knobby tires and more commercially available than 650 size which is used on rest of Force Series. Removable Fork: 7000 series aluminum with adjustable crank housing. Wheelbase: 60" Standard, Overall Length is 84"
Turning Radius: 18 feet for 360° circle, 12 feet w/one backing maneuver. Static Tip Angle: 39° for 250 lb. subject. Propulsion System: Shimano components 27 speeds, 48-36-26 chain rings and 11/34 cassette are standard. The 11/34 cassette is operated by the Hands-On Rapid Fire unit which is mounted on the right hand pedal. To switch to left hand pedal shifting a new Left handpedal with a shifter post can be ordered as an option. It operates both the 11/34 cassette and the hands-on brake. The top chain rings utilizes a cable driven shifter located on upper crank which minimizes cables and their maintenance. Power Add-on Upgrade: BionX® Power Boost adds 25.50, 75 or 100% power assist. Only available with XLT105/Straight back. Factory installation/ Race 44 is required, extra shipping charges may apply. Brakes: SRAM Avid front disk brake is standard with brake lever mounted with shifter on right handpedal. A cable driven Tektro caliper parking brake/second brake is mounted on the upper fork. Crank Set: Traditional crank style Shimano Octolink 170mm crank set is standard. Handpedal width is 18.5” measured center to center of pedals with the crank width adapter set which is standard. The crank width adapter set adds 1.5” per side. V crank upgrade: V cranks 180mm x 20” wide are available for athletes that need maximum clearance. The price includes installation on the crank support. Steering: Pivot steering and raked fork for controlled turning and stability. Crank: Adjustable height both vertical and diagonal. Footrest: Multi-adjustable fore and aft w/straps to securely cradle calves and feet. Straps are 4" wide and feature safety straps for ankles. Performance Wheels/Tires: Alex silver spoked 26-559 wheels with threaded axles and alloy rims. 14 gauge stainless steel spokes. 26-559 x 1.25" High Performance Clincher Cruiser Tire/Tube 100psi is standard. There are many knobby and cruiser tire options available because 26-559 is a common bicycle tire size. Upholstery: Black nylon upholstery with 2” seat and back cushion standard. Seat cushion is 2” thick, 17” deep and either 15” or 17” wide. Seat restraint included. For customers who require maximum leg clearance an optional 1” thick (1/2” firm and1/2” soft) ballistic nylon cushion is available. For tall customers who ride with backrest in the fully extended position a19” deep (2” longer) seat cushion can be ordered as an aftermarket part. Warranty: 2 year on frame and fork to original owner/limited parts warranty. Shipping weight and freight charges: Shipping weight is approximately 55 pounds. Box size is 53” x 20” x 24”. Freight charge to ship within the continental USA is $100 to a business address and $155 to a residential address. BionX Power Boost option adds 26 lbs. Non-standard options noted with * will be shipped separately and charges will depend on size of options ordered. 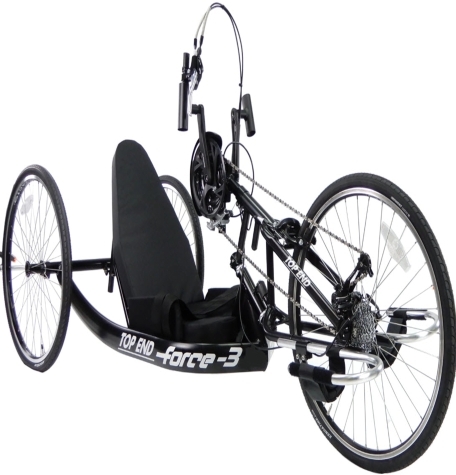 Range will be from $15 to $25, with a $25 charge for each large item such as the wheel bag, handcycle travel bag, training roller or bike rack.